This week on Other Bloggers Family Lives I am featuring Jo who blogs at Kiddie Holidays which is a travel blog for young children, full of holiday reviews, days out and travel inspiration. I love reading Jo's blog as I always end up wanting to travel more with my own children. So let's find out more about the family behind Kiddie Holidays. 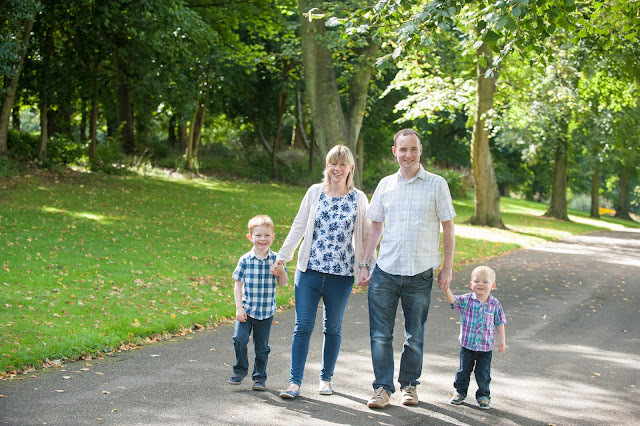 There are four people in the Addison family - myself, my husband Tim and our two young boys Matthew and Daniel. We are a fairly normal family - my husband and I both work (me part time) and the boys love being outside. Even in the middle of winter when it's raining and freezing they still want to play outside! We live just outside Leed, in West Yorkshire. I was born in Yorkshire and have lived here for most of my life, apart from when I worked and lived in London for four years after uni. Then there was a year when me and my then boyfriend (he is my husband now) went travelling. I have been to lots of places in the world, but Yorkshire is my home. Anything outdoors. We are lucky in that there are so many family friendly places around us to visit. Our favourite day out is to Bolton Abbey in the Yorkshire Dales, which is beautiful. We went recently and it is quintessentially Yorkshire with sheep dotted around on the hills and the dry stone walls snaking around the hills. There is a river with a beach at Bolton Abbey which the boys love throwing stones in and paddling in, in the summer there is a Welly Walk which is an activity trail with obstacles to climb over and under. My little one is train mad o we take him on the Bolton Abbey Steam Train beforehand which makes for the perfect day out. Another favourite day out is to York. We park the car outside the city and the boys cycle along the river to the centre where we park the bikes. Last time we were there we went on a York Boat trip which was a fab way to see the city. In the winter, we went to York chocolate story which was a great place to warm up at. The boys loved making chocolate lollies! I would stay in Yorkshire but maybe move to North Yorkshire which is a bit more rural. There are some lovely market towns in North Yorkshire, such as Pickering, they are close to the coast and also the Dalby Forest and North Yorkshire Moors. However, because of our jobs, we need to be near to a large city. I grew up about 10 miles from where I live now. My parents worked really hard and long hours, so we didn't have time for many days out but we had a caravan which we used to take to Filey on the east coast a lot. We loved going to the beach, biking and playing outside - the simple things really. In those days, there weren't any ipads or computer games, so we played outside most of the time and made our own entertainment - that is what I encourage my boys to do now. We recently had a week in the Isle of Wight which was amazing. The weather was really good so it felt like we were abroad! I was swimming in the sea, sunbathing and sometimes I had to remind myself that we weren't in the Med! There is loads to do on the Isle of Wight for kids including days at the beach, the Garlic farm, Donkey Sanctuary, Model Village and of course the chair lift to see the needles. The ferry ride over there is really exciting too. We are off to Duinrell in the Netherland with Eurocamp soon too. Experiencing things like Christmas, Bonfire night and Halloween again through my children's eyes. Things like this become a little mundane when you are an adult but having kids makes them exciting again. I also love getting out and exploring places which I don't think we would do as much if it wasn't for the boys. Thank you so much for taking the time to answer these questions, Jo, it was lovely finding out more about you and your family. We love visiting York as a family too as it so easy to get to on the train from Newcastle, I remember going on the boat tour with my friend a few years ago and I totally agree that it is great for sightseeing. I hope you had a brilliant time in Duinrell, I have been thinking of booking a Eurocamp holiday in the future so I am looking forward to hearing what you thought of it. I love York - always so much to do when I visit. Cute family! Lovely read. It's fab to get outdoors and explore with the kids isn't it?! I wasn't really a fan of Christmas but now we have Erin it's completely different! Bolton Abbey is one of our favourite places to go, it's stunning! We last went in the new year in search of snow! Gorgeous part of the country that way! What a great sounding family. I love posts like this where you can get a great insight into other families and how they function! I'd love to visit the Isle of Wight but am unsure when that might be. I also quite like Yorkshire, lovely, welcoming, down-to-earth people. My kids enjoy exploring the outdoors. They love playing outside. What a lovely interview - it's nice to get inspiration and recommendations from other bloggers especially when seeking out great holiday destinations. Isle of Wight sounds amazing! I would definitely love to visit it someday. What a great interview! I've never been to the Isle of Wight, but it sounds like such a great place to visit with kids!